Fuller was a writer long before he added directing to his résumé: New York City crime reporter, at age seventeen, in the Twenties; pulp novelist (Test Tube Baby? ); and a screenwriter at Columbia by the late Thirties. So it’s fine that The Samuel Fuller Collection, almost uniquely among filmmaker box sets, should include some movies directed by others but based on Fuller scripts or stories; there are five of them, along with two all-Fuller productions. His early film involvements were minor. He was one of four writers on It Happened in Hollywood (1937), the tale of a Tom Mix–like Western star whose career flames out when takies arrive. There’s droll business as the hero (Richard Dix) and his longtime leading lady (Fay Wray) attempt the transition from buckskin and gingham to tuxedo, gown, and drawing-room dialogue, and one party scene features a raft of star cameos—actually, star-lookalike cameos. Adventure in Sahara (1938) started life when omnivorous reader Fuller, invited to make a pitch to a Columbia exec, improvised on the spot: “William Bligh meets Victor Hugo!” The whiplash-inducing melodrama that resulted has Paul Kelly joining the Foreign Legion to avenge his kid brother’s death, caused by the sadistic commandant (C. Henry Gordon) of Fort Agadez, “the Inferno of the Sahara.” So there’s our Captain Bligh, ripe for mutiny; the Victor Hugo part, a variation on a chapter in Hugo’s ’Ninety-Three, comes when Kelly and his fellow mutineers decide to … well, the cockamamie picture’s just 56 minutes long—see for yourself. Hard-core Fullerism sets in with Power of the Press (1943). Although he’s credited only for story, the dialogue has Fuller’s headline punch, and of course newspapering was an alternative universe he knew inside-out. A publisher whose once-honest New York tabloid has been ideologically hijacked is aiming to make a course correction. Minutes after saying, “The power of the press is the freedom to tell the truth—it is not the freedom to twist the truth,” he’s a dead man. The rest of the movie deals with the efforts of his old friend, small-town newsman Guy Kibbee, to complete the paper’s redemption. Made in mid-WWII, the picture angrily and explicitly likens homegrown demagoguery to Nazism—and its condemnation of media organizations “playing on the prejudices of stupid people” has acquired fresh relevance. Otto Kruger and Victor Jory (“a little Himmler”) supply the villainy, while Lee Tracy steps up to save the day as a case-hardened yellow journalist named Griff. Another Griff (Fuller loved that moniker) shows up in Shockproof (1949), a fascinating instance of two auteurs on one movie. Fuller wrote the novel The Lovers and had first crack at the screenplay; the director was Douglas Sirk. 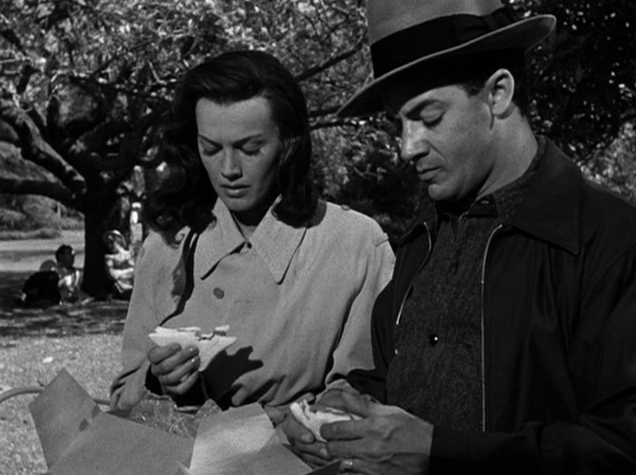 Cornel Wilde plays a parole officer who falls for convicted murderess Patricia Knight (Mrs. Wilde at the time). For most of its length the film sustains genuine ambiguity regarding the woman: victim or manipulator? gingerly moving toward reformation, or waiting for the first opportunity to split? We get inklings of Fuller’s 1964 The Naked Kiss. Ultimately it’s Sirk who prevails, with his dynamic noir mise-en-scène and characteristic running visual commentary on the spaces people live in. See especially the gingerbread-house family home Wilde shares with his mother, and then the amazing setting for the lovers-on-the-run: a company house in the midst of an oilfield, with derricks endlessly pumping mere yards from its transparent wire-mesh walls. Scandal Sheet (1952) is one more case of Fuller material handled by another estimable director: Phil Karlson, a crime drama specialist with a fine sense of frenzy. In this adaptation of Fuller’s novel The Dark Page, Broderick Crawford is a hard-nosed newspaper editor with machine-gun delivery and a shrewd crime reporter, John Derek (quite good), whom he’s trained as his spiritual heir. There’s a semi-accidental murder, and then another with nothing accidental about it. Donna Reed plays Derek’s fellow reporter and underappreciated love interest, and the oft-mocked Rosemary DeCamp does some juicy character acting in a key role. These DVD collections are always limited by what company holds the copyright on which movies. We get only two Sam Fuller–directed movies here because they’re the only two he made for Columbia (now owned by Sony). 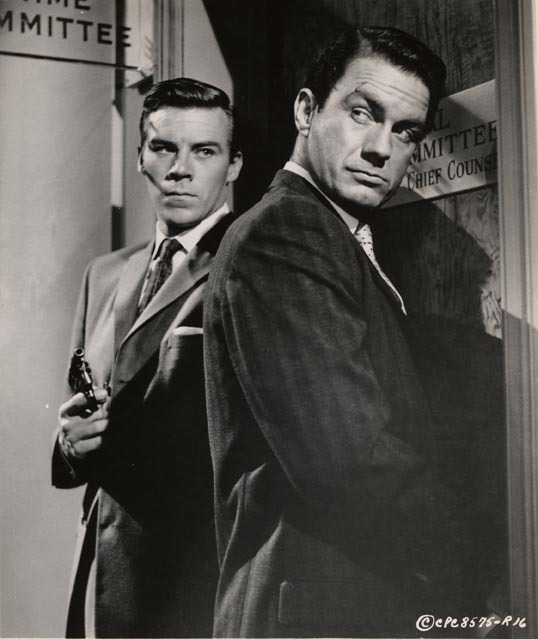 One of these is a primo, in-your-face Fuller title: Underworld U.S.A. (1961), which gave Cliff Robertson a chance to play a complete slimeball—and he’s the hero! He’s also the grown-up version of the teenager (David Kent) who watched his small-time crook of a dad murdered in an alley, beaten to death by thugs who would go on to become underworld kingpins. The film observes Robertson’s revenge as he rises in their criminal empire, but the most disturbing scene centers on Richard Rust as a soft-spoken killer. Two years earlier, Fuller had made The Crimson Kimono (1959), a much less successful movie but one with bravely complicated ambitions. Two Los Angeles police detectives (Glenn Corbett and James Shigeta) investigate the murder of a stripper shot down in the middle of Main Street (a scene Fuller filmed without forewarning the local citizenry). As the case unfolds, both guys—partners, roommates, and blood brothers since the Korean War—fall in love with the same key witness (Victoria Shaw). Fuller returned again and again to the theme of America as a multiracial, multicultural society; The Crimson Kimono, in addition to many passing tributes to the Japanese-American community, dares to explore the theme of a sympathetic minority figure who projects racism onto others. Appropriately, the movie is filled with jagged compositions and deliberate violation of smooth editorial rhythm, all in the service of portraying a world populated by myriad Others. As with previous Sony box sets devoted to Boetticher and Stanley Kramer, the technical quality of the prints is first-rate (though it’s worth noting that even when Columbia was one step up from Poverty Row—”Columbia the Germ of the Ocean”—the studio’s movies looked crisp and clean thanks to cameramen like Joseph Walker and Franz Planer). There are no running commentaries, but several separate featurettes have Martin Scorsese, Wim Wenders, Curtis Hanson, Tim Robbins, and Christa and Samantha Fuller paying informed and affectionate tribute to Samuel Fuller the filmmaker and Sam Fuller the man. Tags: Adventure in Sahara, It Happened in Hollywood, Power of the Press, Sam Fuller, Samuel Fuller, Scandal Sheet, Shockproof, The Crimson Kimono, Underworld U.S.A.